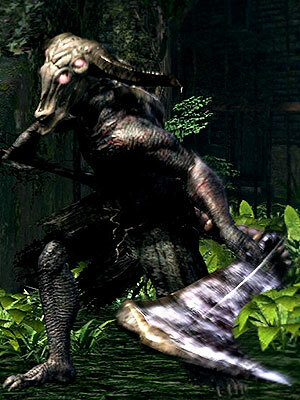 A lesser demon resembling a humanoid with a goat's head, wielding two large machetes. He has two Undead Attack Dogs with him. After the area with the Undead Attack Dogs and Undead Assassins. Also takes extra damage from Black Knight Weapons. Basic horizontal swings, up to 4 hits in a combo (*two 2-hit combos consecutively*). Two handed swing, has a long windup. Don't try to block it, move away from him when you see him wielding his blades together. Jump attack, telegraphed by standing still and crouching a bit. Will cause knock down, high damage and break through shields. Often uses it when you climb the stairs. Note: On NG, this attack can be blocked completely using a Balder Shield +5, with stamina level at 12 Endurance. You will have about a sliver of stamina left, assuming your stamina was at full before blocking. Highly recommend turning off Camera Auto Wall Recovery in the options menu before this fight as it is an enclosed area and you want to know exactly where you stand in it. This is recommended for the rest of the game but more so for this fight. 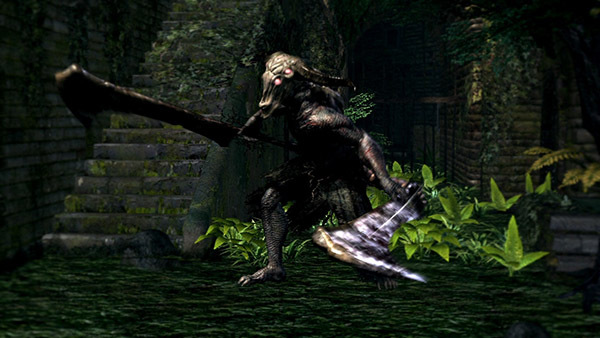 Killing off the Attack Dogs is your first priority (thus the need for a good weapon), take the first one after dodging the demon's first attack and then head to the back of the area to find the second one hidden in a little alcove in the far right corner. Alternatively they will both chase you if you immediately run up the stairs where you can dispatch them. He may immediately attack you upon entering the courtyard on subsequent attempts. If you are having trouble with this, roll towards the stairs to dodge the attack (rolling right will get you trapped). His attacks can be blocked relatively easily with the exception of his two-handed overhead smash and jump attack. These two attacks have narrow areas of effect so just roll or step to the side to avoid them. Keep circling him and make sure he doesn't trap you against a wall. Increasing your Poise can help if you are having trouble with being staggered by the demon and/or Attack Dogs. The Wolf Ring is a particularly helpful item for those who aren't using heavy armor. For lighter builds, the start of the fight can be exceptionally difficult. You need to time a roll to dodge both the demon and the first dog, then your best bet is getting up the stairs and quickly killing off the dogs. The stairs can be ascended to provide a brief respite from the demon (he will follow you) should you have trouble finding an opening to attack, but note he will usually use his jump attack as you do so don't dawdle. You can also lure the demon up the stairs then jump off when he is about half way up, run past him so when he jumps down you won't get cornered. He'll jump off as well and then need some time to recover from the fall so you can get a few hits in without risk. You can watch a video here. You should also have at least the Drake Sword for this fight. He is weak to fire so you can apply Charcoal Pine Resin to your weapon for some extra damage. As a demon he will take additional damage from Black Knight weapons but it is unlikely you will have found one or be able to wield it at this point in the game unless you are on NG+. You can do a jumping attack from the platform at the top of the stairs if you can lure him under it. Note he will try to follow you up the stairs and this strategy isn't as effective as it was against the Taurus Demon. While not a ranged fight per se, ranged builds will have a tough time getting into this fight as with how early it is in the game you likely have not got a solid melee weapon you can equip, especially in the case of Sorcerers. Given how quickly the dogs can attack you, you do not have time to wind up your spells or ranged weapon. Do not try to take the dogs with an inferior weapon such as a Dagger, it takes too long leaving you open for attack from the second dog and/or the demon itself. You should aim to roll past the demon and the first dog, perhaps block the dog's leap with your shield to prevent yourself being staggered, then run to the top of the stairs and hit the dogs as they ascend. If you only kill one dog by the time the demon is on the stairs that's fine, just jump off. The demon and dog will follow you but will take much longer recovering from the fall, allowing you to kill the other dog. You can then kite the demon around and hit him with your ranged ability after back-stepping his attacks. You can utilise Bleed damage from something like the Bandit's Knife, or toxic damage from Dung Pies (available from the Undead Merchant Female). You can also use Firebombs at range for some additional damage. If you have Hidden Body or the Ring of Fog you can use it before entering the fog so that the dogs do not attack you (the demon still will). The Aural Decoy Sorcery will distract the demon allowing you to deal with the dogs. The Lightning Spear Miracle does significant damage. If you are really having trouble and want an easy alternative to this fight, you can hit the Capra Demon from outside the fog gate by manually aiming Dung Pies or Firebombs and throwing them over the wall at the correct angle. You can watch a video here. The fog gate will disappear once he is dead and the dogs will attack you if you are in range.